BEST ANSWER: I just purchased this product in Nov 2018 and the label on back states "Made in China". Their website specifications state that the compressor is made by Embraco, a Brazilian Company. I am assuming the compressor is manufactured in Brazil, but you never know. There were no markings on the refrigerator as to it's origin. I'm going to assume is was manufactured domestically. If it is not costing me in higher electricity then zi am very happy. 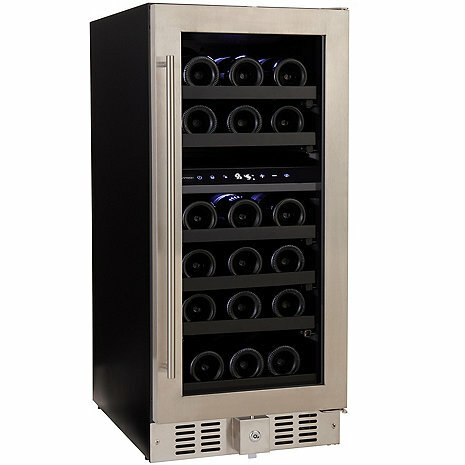 The N'Finity Pro2 Dual Zone wine cellar is a nice unit. It works very well however I have one concern, it runs a lot of the time. I do not know if that is the compressor or a circuk as ting fan gor the colder dual zone top. Just concerned my electric bill is higher. I was told it is very energy effivient but no one has addressed the almost constant running. The unit is good, but it seems to cycle on and off continuously. The cool area warms by 5 degrees relatively quickly so the unit turns on to cool it back off. Makes me worry the motor will burn out fast. I would have thought a small unit like this would not need warm up so fast and need to cool itself off so much. On the positive side, it keeps good temperature. Sturdy handle. However, it's not as quite as advertised and it cycles on/off frequently. Also they placed the temperature controls in the center of the unit so it's always viable. I don't think that kind of visibility is necessary; a less conspicuous spot would have been just fine.